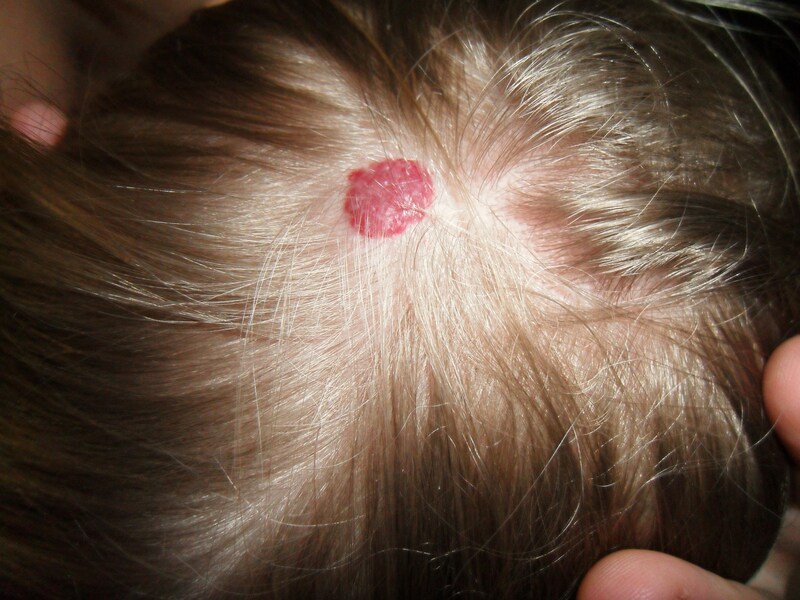 Approximately thirty percent of all hemangiomas are visible at birth. The remaining seventy percent become visible within one to four weeks after birth. Hemangiomas occur 5 times more often in females than in males and occur predominantly in Caucasians. Low birthweight infants (less than 2.2 pounds) have a twenty six percent chance of developing a hemangioma. We invite you to learn more about the psychological profile of children and families afflicted with hemangiomas, and read Lola’s Story, a little girl born with a hemangioma. If you’re a parent with a child who has a hemangioma, you should not feel guilty, as the occurrence or appearance of these birthmarks has not been determined. The important thing to remember is that accurate diagnosis and early intervention is key. Hemangiomas, like people, come in all shapes and sizes. Some are small and hardly noticeable, while others are large and disfiguring. Here’s some further information from the Mayo Clinic. Approximately eighty three percent occur on the head and neck area. The remaining seventeen percent appear throughout the the rest of the body (both externally and internally). In the early stages some appear either as bluish or reddish spots or flat patches. 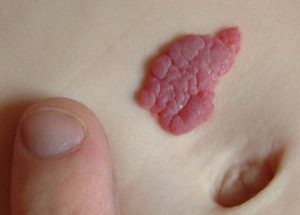 A hemangioma is rarely fully grown at birth. Hemangiomas that are flat and appear reddish in color are called “superficial” and those that are deep beneath the skin and appear bluish in color are called “deep” hemangiomas. When a hemangioma is both deep and superficial it is called a “compound” hemangioma. The correct diagnosis is critical for proper treatment. Hemangiomas can grow for up to 18 months and then begin a long slow regression known as involution. This involution can last from 3- 10 years. While all hemangiomas eventually ‘involute” the result is not always cosmetically acceptable. Early intervention has been shown to reduce the need for corrective surgery after “involution” has occurred; or to, at least, minimize extensive corrective surgeries in the future. Psycho-social scarring which occurs when a child has been forced to live with a facial deformity until “involution” has been completed can be avoided by early, aggressive intervention. In some cases, hemangiomas can be life threatening or severely problematic (interfering with eating, breathing, seeing, hearing, speaking, etc.) and require immediate aggressive intervention. Hemangiomas that grow internally can be very dangerous. They are difficult to detect and when they are detected, the infant is often in need of immediate intervention. Internal hemangiomas (referred to as visceral) occur in the liver, intestines, airway and brain. Infants who have what is referred to as hemangiomatosis ( multiple hemangiomas) are suspect for internal lesions. When an infant has more than 3 hemangiomas, an ultrasound should be done of the entire body to rule out internal lesions. Jaundice may be a sign of liver hemangiomas, blood in the stool may be a sign of hemangiomas on the intestines and stridor (croupy cough and difficulty breathing) may be a sign of airway hemangiomas. Need a medical opinion? Ask the Expert!